I LOVE Blue-Green inks. I mean I REALLY love Blue-Green inks. ND Turquoise is one of my favorites along with Diamine Steel Blue. 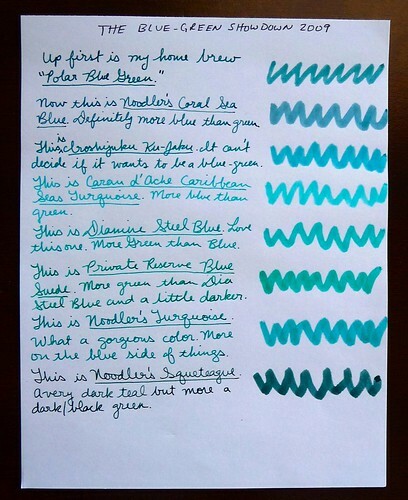 Noodler’s Turquoise isn’t really turquoise. Instead it is a medium-dark blue leaning blue green. This is not a bulletproof ink or an eternal ink. This one is just a part of Noodler’s standard ink line. Not much different in composition from your run of the mill fountain pen ink brands. It behaves very well and is not overly saturated. Fantastic ink all around. The flow is excellent and the lubrication is quite good. My nib floats across the page. The drying time is a little slower than average at 7-10 seconds, but not slow enough to cause any problems. I haven’t seen much more than minimal shading out of this ink, but I’ve only had it in this fine nibbed pen. Shading might be more pronounced in a stub or italic pen. This ink is not bulletproof or eternal. It isn’t even water resistant. It washed completely away almost instantly. Have you tried Lamy’s blue-green? 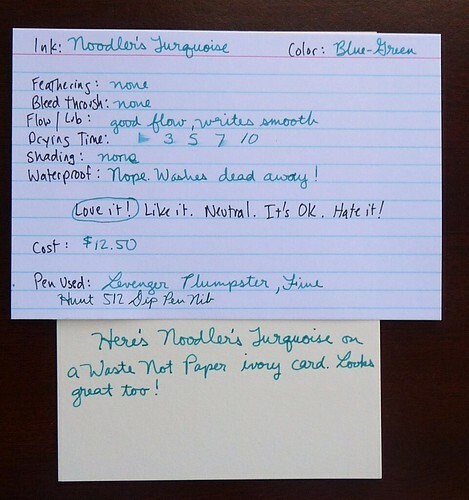 It’s similar to the Noodler’s Turquoise / Caran d’Ache Caribbean Seas / Diamine Steel Blue, if my monitor is displaying your color cards correctly. These colors are too bright for me for all but the rarest of uses, but I had to get the Lamy because it’s just so stunning. I had missed your blog completely and was very happy to find it and this great comparison! I will return!